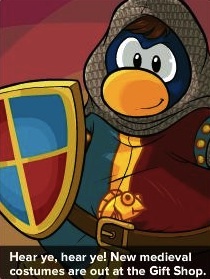 Club Penguin Cheats by Mimo777 Club Penguin Cheats by Mimo777: Club Penguin Medieval News! This week's Club Penguin Times' featured article is, of course, about the upcoming Medieval Party! Construction for the Party will begin next week! And, to prepare for the party, the Gift Shop is offering medieval costumes! Here are this weeks Upcoming Events! 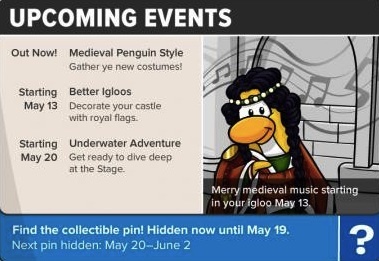 Saweet, the Underwater Adventure will be here this month, too! What coolness are you ready for? Notice in the News flash, where it says Enviromental Portables Found, It has the letters EPF highlighted! Could be a clue to Herberts danger ahead! Awesome! It starts 4 days before my birthday lol! If last medeival party was really fun,this one should be even better!